On January 15, CBR has resumed FX-purchases for the Finance Ministry in line with the fiscal rule formally introduced in 2018. Open market FX purchases were terminated after August 23, 2018. The Finance Ministry announced that it will purchase RUB 266 bln worth of FX from 15 January to 6 February. 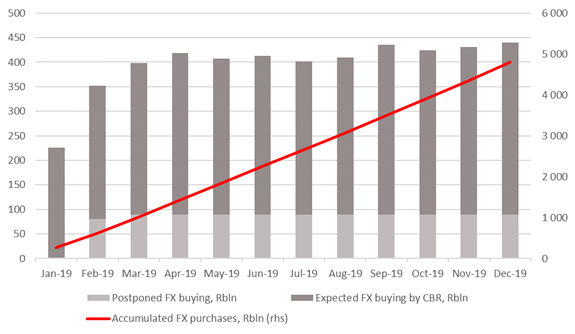 The sum amounting 4-5% of the average monthly FX trading turnover is by 30% less than average monthly FX-purchases and will therefore have limited impact the rouble. Importantly, the market priced in MinFin’ renewed interventions as far back as December. CBR’s Governor Elvira Nabiullina announced the plans to resume the buying at a press conference following the last key rate decision. We believe that there’s strong potential for the rouble to strengthen against USD to 65.5 by the end of the Q1. Over the past decade, the first quarter has traditionally been a positive period for the Russian currency, given strong current account surplus and low external payments. In January-March, external payments of the Russian major corporates will fall by 42% y/y, given intra-group lending adjustments, according to CBR expectations. Fundamentally, there are good conditions for the rouble’s strengthening, but the level of crude oil volatility that impacts the exchange rate, remains high. 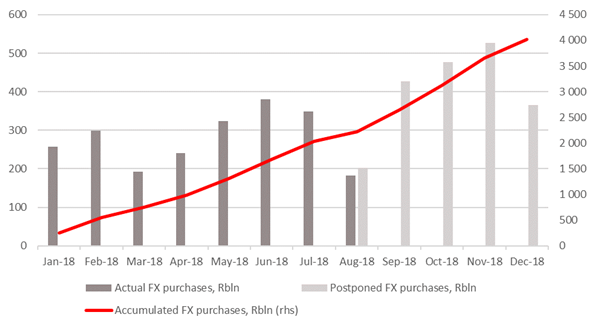 The FX purchases suspended by Minfin in second half of 2018 and a strong current account surplus in 2018 contributed to stabilization of FX-liquidity at a comfortable level, reducing potential risks going forward. Last year’s high oil prices helped the CBR to make open market FX purchases for MinFin in amount of RUB 2.2 trillion ($37 bln). Additionally, the bank made non-market FX-purchases worth 2 trillion roubles ($30 bln). It’s off the market and on balance transaction recorded as an increase in FX liabilities to Finance Ministry. Part of suspended purchases was used “to cover external liabilities, with the bulk used to replenish foreign assets of both the banks and the corporates,” head of the CBR’s monetary policy department Alexey Zabotkin said. CRB may opt to spread FX-purchases out over several years, he said. The move will result in lower monthly buying compared to the planned volumes, and, in turn, reduced impact on the currency and money market. The programme’s timing will largely depend on sanctions, oil prices and the overall global market volatility, CBR’s Governor Elvira Nabiullina said. If the CBR takes a moderately conservative approach, it may opt to spread suspended purchases over 2 years starting from February. If it is the case, the suspended monthly purchases will reach RUB 90 bln ($1.4 bln) in 2019 and RUB 84 bln ($1.3 bln) in 2020. All in all, open-market total FX-buying in 2019 may reach RUB 4.8 trillion ($71 bln) if Urals averages to US$63-65/bbl vs 2.2 trln last year. Suspended purchases will amount to RUB 3.8 trln, conditional on projected oil prices and additional suspended buying worth RUB 980 bln. If this is the case, total annual buying will double in 2019. Brent 2019 consensus by the leading global investment banks is $65-67/bbl, down from up from a previous forecast of $70/bbl. We believe that FX-purchases under conservative scenario will be material amounting to about 8-10% of the average monthly FX-trading turnover against 5-7% last year. However, it is difficult to assess their net effect on the rouble, given many factors affecting the exchange rate. For example, sanctions against Rusal became the key driver of rouble volatility triggering massive foreign capital outflow from the OFZ market. The threat of a second round of sanctions against Russia in August, overall capital reallocation from emerging markets to the US market amid a global slowdown, aggressive U.S. dollar funding rates tightening, trade wars and other factors also contributed to the rouble fluctuations. We can safely assert that FX-buying will limit upside potential for the rouble even if the environment is favourable (higher oil prices and moderate sanctions) for the Russian currency. It will keep the rouble in a narrow range of 64-67 roubles per dollar, given that the CBR may build up pressure on the rouble through suspended purchases for the MinFin, thereby ramping up monthly buying. Many of the 2018 risks spread over to 2019, such as possible sanctions against Russia over nerve agent use in Salisbury and the U.S. - China trade wars. But unlike last year, they are expected to hit the market rather sooner than later with corresponding implications for the market. We expect that possible sanctions against Russia will have a neutral effect on the market (with no restriction to OFZ primary market trading for non-residents and no blocking the Russian commercial banks’ FX-accounts) and a positive one if the U.S. - China trade spat is over. Our end-year projection for the rouble is RUB 67.5 per dollar (the average rate is about RUB 66 per dollar); last year, the USDRUB pair averaged at RUB 63 per dollar and hit RUB 69.8 per dollar by the end of the year.